I've not posted much food in the past two weeks. So, I'm going to save the running in NYC post for next Monday. Hope that's alright with you. I received such a wonderful response to yesterday's No-Bake Layer Bar recipe, I thought keeping the flavor train moving was what we all needed. I am (way) behind on meal preparation after our trip, which means I don't have the usual stuff -- like freezer waffles -- for Ada's breakfasts. We're also out of eggs, which is Ada's daily go-to for the AM meal, so I needed to improvise this morning. What could I give her with some added protein? 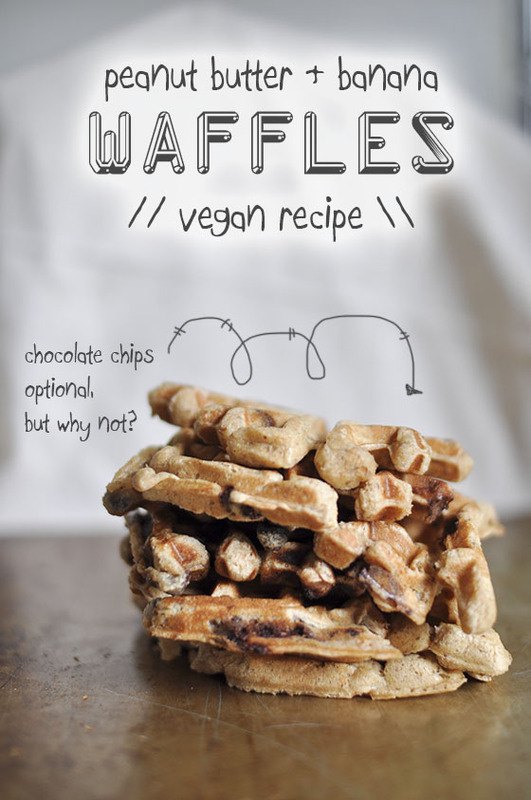 6-8 waffles, vegan recipe for kids and adults alike! * I'm sure smooth peanut butter and/or almond, sunflower, etc. butter would work great, too. In a large bowl, whisk together your dry ingredients. Set aside. 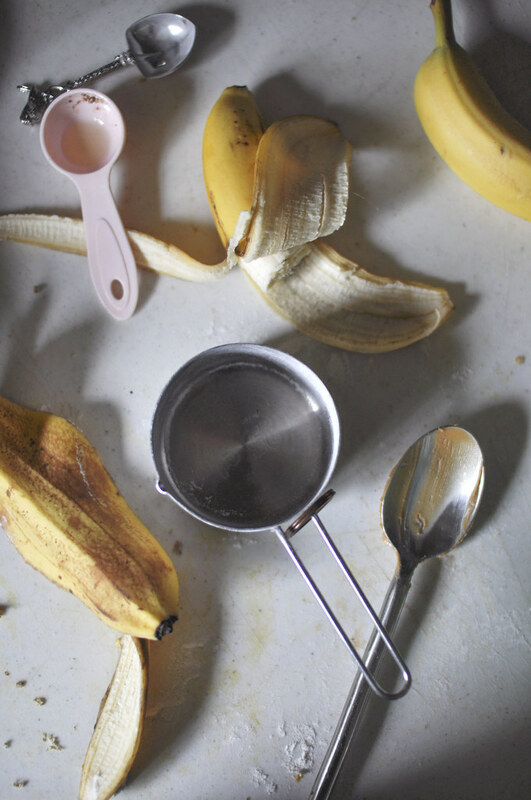 In the bowl of an electric mixer, mash your banana with the paddle attachment on low. Then add the rest of the ingredients on the list (not the dry yet, though!). You may also use a food processor or even just mash and mix by hand, for that matter. Preheat your waffle iron, then make sure you grease it up well with oil or butter or Earth Balance and make waffles as directed. Feel free to add-in chocolate chips, white chocolate chips, peanut butter chips, or whatever else floats your boat. Don't have a waffle maker? No problem. This recipe would work well for pancakes, too. 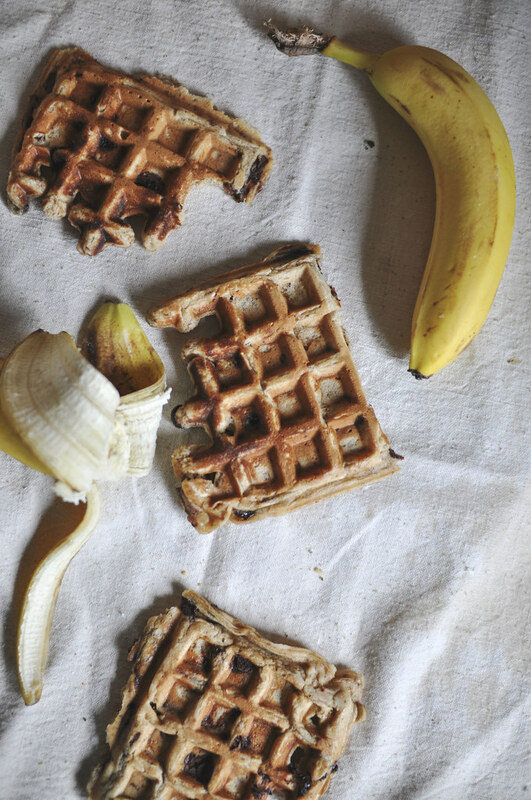 You can get an adequate waffle machine for under $20, scratch that, under $10. It may not be fancy, but it does the job for us every Sunday. Want to save some for later? Just follow the instructions in this Homemade Freezer Waffles post for how to freeze/store waffles. Toppings suggestions? I actually ate them dry because I added chocolate chips (Ada's were plain, though). But I'm sure maple syrup or even more peanut butter would taste delicious. I had planned to freeze these to toast tomorrow, but -- alas -- I didn't plan my lunch EITHER so, down the hatch three more went. I know it's always a matter of preference, but I think they were even better frozen and then toasted. A crisper texture is always my favorite. Make them this weekend, please! Or maybe these Green Egg-Topped Waffles are more your speed.